Below are some great tools and videos to help you run a profitable sale. 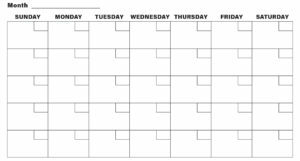 Fill out the plan for your fundraiser using a calendar. Need one to work from? Click here for a printable calendar. 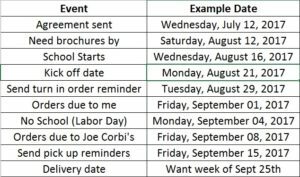 Plug in the key dates like when you need brochures, kick off, orders due to you, orders due to Joe Corbi’s, delivery week, listing any school holidays/closings, and make adjustments to make your plan work! Looking for inspiration? See an example below. The following are some sample cover letters your organization may use as a starting point.